The United Nation Human Rights Committee (UNHRC) will review Thailand’s human rights situation and its compliance with the International Covenant on Civil and Political Rights (ICCPR), which Thailand is a state party. Thailand will be reviewed during the 119th session of the HRC between 13-14 March 2017 in Geneva Switzerland.Prior to the review, several Thai civil society organizations have engaged in the ICCPR process through the submissions of alternative reports to the UNHRC and advocacy activities. Office of the United Nations High Commissioner for Human Rights (UNOHCHR) and the Thai Civil Society Network on Civil and Political Rights would like to invite the media and everyone to join the live webcast of Thailand’s second periodic report on International Covenant on Civil and Political Rights (ICCPR) compliance, “From Bangkok to Geneva: Engaging Public on Thailand ICCPR Review”. 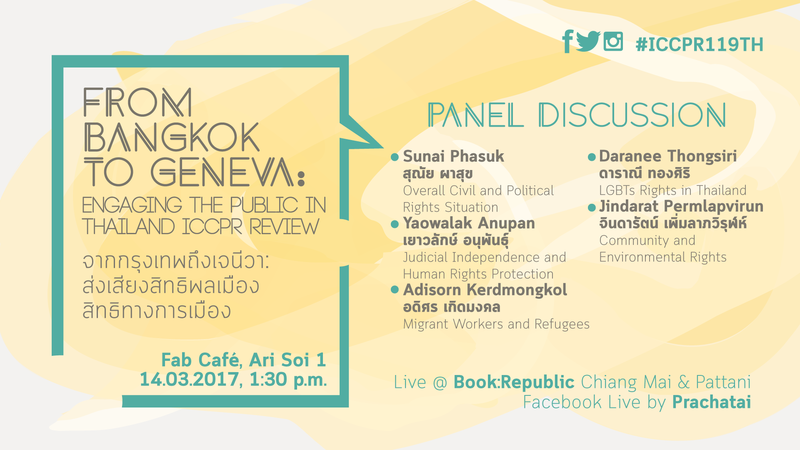 In addition to the webcast, there will be a panel discussion on the topic ‘What are concerned issues, What to be follow-up from ICCPR Review’ by representatives of Thai civil society. The event is organised by the Office of the United Nations High Commissioner for Human Rights (UNOHCHR) and the Thai Civil Society Network on Civil and Political Rights. FORUM-ASIA is a co-host of this Network. When: Tuesday, March 14, 2017, 13.30 – 17.30 PM.